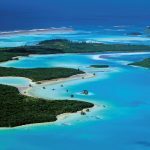 New Caledonia and its adjoining Loyalty Islands lie approximately 800 nautical miles to the east of Queensland, Australia, with Brisbane or the Gold Coast being the closest points of departure to clear out. They are the first group of islands encountered when cruising the Pacific from Australia and well worth exploring as they comprise some of the most scenic “postcard” locations found anywhere in the world. DEPARTING Queensland at the end of August the south easterly trade winds are the predominant weather system that is almost guaranteed to be encountered. They can vary in strength from a pleasant (10-15kts) to “why are we here?” (25kts +) making the three day crossing at eleven knots rather tedious. Observing the weather systems and associated conditions moving east to west generally will give you a good indication as to picking an appropriate weather window for departure. I also made use of the Bureau of Meteorology’s Brisbane office special services unit, who for a small fee offer a weather routing service with updates of expected conditions before and during the transit. I found them to be very accurate with their predictions within 10 – 15% of the conditions we encountered. Our arrival off the coast of New Caledonia after an uneventful crossing found us entering through the reef at Passe du Dumbea, which is not only the closest channel through the reef to Noumea but is also used by the majority of cruise ships that frequent the area. It is well buoyed with both a port mark and a west cardinal and has an average depth of 35 metres. There is a bank that runs due south from the west cardinal to the tip of the southern part of the reef so the passage is through the opening dog legs to the north if you want to remain in the deepest water. 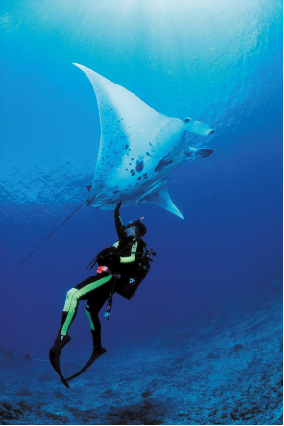 As with all reef openings, especially off the Great Barrier Reef where the deep water of the continental shelf meets the reef edge, rip conditions can be encountered causing a choppy transit when a large ebbing tide is present. This particular opening was not in anyway difficult when we passed through at the bottom of a run out tide. Once inside it is an easy 13 nautical mile cruise to Port Moselle and the visitor’s wharf where the customs and immigration formalities are completed. This floating marina can accommodate yachts to 35m for clearance, larger yachts generally will be directed to the other floating marina around the corner at Port Du Sud or over to the scientific wharf opposite Port Moselle. 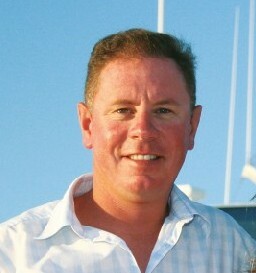 I used Noumea Yacht Services as agents for the duration of our stay. Jean-Marie Demaret and Franck Farina (who also happens to be Port Moselle’s Harbour Master) couldn’t do enough for us and made the clearance/immigration formalities a breeze. I thoroughly recommend their service as we used them for a myriad tasks including interpreting at the local fish market! Noumea, the capital, is a modern, reasonably sized town with all the ambience of a French colony. The international airport is approx. 30 minutes out of town and there are plenty of services and trades available for just about any yacht work. Bunkering is easily organised through NYS and the local supermarkets (Woolworths, etc) are within easy walking distance. The markets are 100 metres from Port Moselle marina and affords any guests the opportunity to enjoy the local produce and wares. We found the provisioning to be excellent with produce and variety as good as anywhere. If any down time is available between guest trips Noumea is a fun place to relax with some pretty beaches and great restaurants / night clubs in town and also around the corner (5 minutes in a taxi) at Baie de Citrons, complete with South of France prices. An easy overnight anchorage can be found approx. 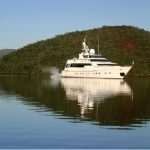 eight miles north of Port Moselle at Bai Maa which is a scenic anchorage affording a great sunset in approximately 8 – 10 metres of water on a mud bottom. This is handy to escape the south easterlies but you still remain close to Noumea if need be. Amedee Isle is another relatively close location worthy of a visit. Approx.12 nautical miles south of Port Moselle this is a picturesque little cay supporting an historic 45 metre lighthouse. Only a mile in from the Passe du Nord, another reef opening, this little islet benefits from clean Pacific Ocean water on an incoming tide making the snorkelling upon the fringing reefs very worthwhile. A great location for introductory dives or snorkelling for guests to boost their confidence as there is easy access from the beach. The anchorage gives reasonable protection from the south easterlies in approx. 5 – 8 metres. Visit here mid week if possible as it is a busy place on the weekends. Tabu reef due west of Amedee offers a great dive with an old timber minesweeper sitting on the bottom in approx. 25 metres of water. There is an abundance of fish life on the wreck and good visibility most of the time. An ideal time to dive it is on the slack water at the top of the tide. Cruising to the southern end of the main island and through Canal Wodin finds you at the entrance to the Baie du Prony. Travel north up the bay as far as Port du Carenage passing to either side of an isolated danger mark and the anchorage is at the junction of two bays. This is an amazing area. The French have strip mined the surrounding landscape, although it is slowly growing back giving a surreal landscape. The water is crystal clear and supports some of the most amazing coral reef and sponge gardens that you just do not expect to find so far away from the open ocean. There is a 10 minute walk along a clay trail to some natural hot springs and is worth a visit for this alone. We encountered no other vessels up here, and total glass outs make it ideal for water sports. This anchorage is approx. 34nm steaming from Noumea. Ile Ouen which forms the southern shoreline of the Wodin Canal offers a very sheltered and picturesque anchorage in either of the bays Port Koube or Anse Kembe. It is an all weather anchorage in approx. 6 – 8 metres being almost a landlocked bay. Travel south past the entrance till you pass the end of the bank then cut back up to the North keeping the fringing reef a safe distance off the portside. It is obvious when you transit through here in sunny conditions as the bank on the starboard side is easily visible. A general rule of thumb when transiting around and through coral reefs and reef openings, especially reefs not adjoining land, is to be where you want to be and anchored by 1600 as turning back to the west to navigate through reefs in the waning sun is fraught with danger. 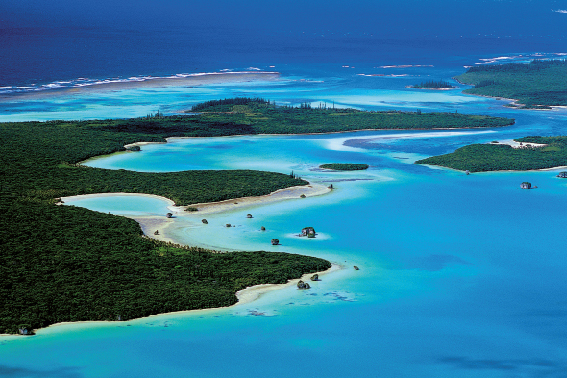 The pinnacle of all the cruising grounds in this southern area in my opinion is the famous L’ile Des Pins (Isle of Pines). 65 miles from Noumea, it is an easy day’s run with about thirty miles in open ocean. Lead lights bring you into Kuto Bay. The Island itself is quite large with a sealed road network and an airport making guest transfers back to Noumea convenient. Hire cars are available and there is a five star resort on the eastern side of the island. Kuto Bay is the pick of the anchorages offering good protection from the trade winds. The bottom is sand and is good holding in approx. 5 – 7 metres. In the unlikely event of the wind swinging to the north, which it did for 24hrs out of the seven days we were there, move around to Baie de Kanumera approx. 1 ½ miles around the headland or 20 metres across the road from Kuto Bay. This bay is spectacular for the rock formations protruding out of the water at the beach end and is the “trademark” tourist picture for New Caledonia. For yachts over 30 metres swinging room can be tight especially if the cruising yachties get the same idea, so a stern anchor deployed can reduce stress considerably. 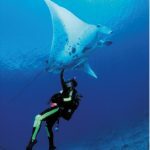 This area has truly crystalline waters and very fine white silica sand, and the local dive operator has some of the best scuba diving in New Caledonia on offer. The long gently sloping beach in Kuto Bay makes this anchorage a favourite with guests. The local gendarmerie (police) will drop by to check your previous clearances but it is more out of curiosity and we found them to be friendly and a great source of information on sights worth visiting on the Island. A few boat T-shirts offered as a thank you for the info will set you in good stead for the rest of your stay. As with other places, there are a few local rules to be observed including the operation of motorised water sports, as jet skis, wake boarding, etc, cannot be carried out in any of the bays. You must be past the extremities of the headlands. 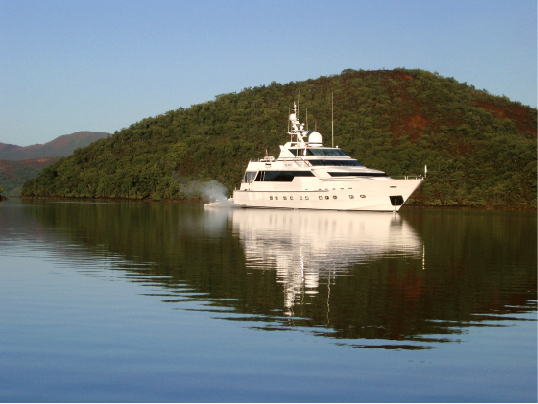 Noumea Yacht Services can supply all the local rules. The Loyalty Islands lie approx. 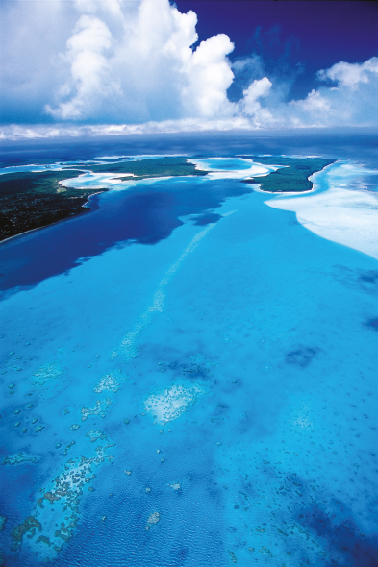 60 miles off the west coast of New Caledonia and comprise three main Islands. Ile Mare is the southern of the chain, followed by Lifou approx. 30 miles north west then the lagoon atoll of D’ouvea a further 40 miles north west. We unfortunately did not spend much time exploring these islands other than 24hrs at Lifou on the way through to Fiji. Lifou was again very scenic with a good anchorage in approx 16 metres of water off the beach in Baie de Gaatcha. The water is incredibly clear and constant checking of the sounder was needed to confirm we were in deep water as the sea bed looked as if it was just below the surface! The bottom here has lots of scattered reef so positioning of the anchor was important for a hassle free departure. This wasn’t hard to do with 50 metre visibility! Lifou is approx 133 nautical miles from Noumea via the Havana Passage and customs and immigration were not available on the islands so clearance out involved returning to Noumea or flying customs out to the yacht via a charter flight. This may have changed since our last visit but again the boys at NYS will be able to inform you on this protocol. Our next foray back to New Caledonia will see us exploring D’Ouvea as fellow captains have told me this is also a must see. New Caledonia and its surrounding islands carry with them a turbulent but interesting history as the spread of French colonisation took hold on the islands. There are many historical buildings in most of the areas we visited with the old gaols of particular interest. But rest assured we found all the local islanders and French inhabitants extremely friendly and very accommodating. 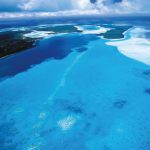 If you are passing through to Australia, a detour to New Caledonia is a worthy stopover that will add to the highlights of your South Pacific Adventure!